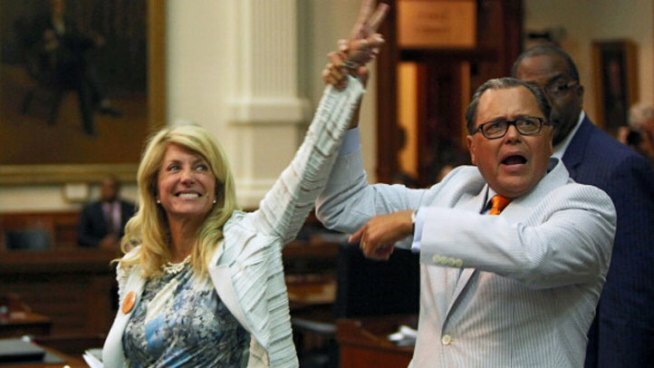 Yesterday, State Senator Wendy Davis (D-Tarrant County), the Democratic nominee for Governor, underwent her famous (or infamous, based on your political persuasions) filibuster. At issue was a bill then-known as SB5, an omnibus anti-abortion rights piece of legislation that did four main things. First, it banned all abortions at 20 weeks, as opposed to the 24 week cutoff ordered by the Supreme Court for many years. Second, it required that all doctors providing abortions hold admitting privileges at a nearby hospital. Third, it required that a pill taken as part of a standard per-procedure the night before be administered directly by the physician. Fourth, and perhaps most significantly, the bill required all clinics to adhere to the standards of ambulatory surgical centers, a bar only six clinics reach (two in Houston, one in San Antonio, one in Austin, one in Fort Worth and one in Dallas). I go to excruciating lengths to delineate all of the components of the bill because what Davis did has been the cause of some debate over the last year. The Democrats, in my opinion, have been terribly ineffective in combating the narrative presented by Republicans: that the bill was all about the 20 week ban. Indeed, that part was not even challenged in the lawsuit and Davis has stated her personal support for the provision. Make no mistake, the ambulatory surgical center requirement is the crux of the bill, which necessitated Davis’ action. This bill could not garner the needed 21 votes in the Senate to be brought up in the regular session, so Governor Rick Perry added it to the call of a first special session, where the aforenoted dilatory measure in the State Senate does not apply. House and Senate panels listened to hundreds upon hundreds of women who testified against government overreach into their personal lives. In both cases the Chairmen (yes, MEN) of the committees unilaterally –and arguably in violation of rules– ended testimony with many other women yet to testify. The numerous hearings, as well as the fact that Perry put four high-profile items on the call of the first special session, left the most important days in the SB5 for the end of the month, right before the 30 day session ended. After more hours and hours of dilatory tactics and testimony from House members, the bill was finally passed out of the lower chamber with about a day and a half left with the time allotted for the session. However, Senate rules hold that all bills passed out of the House must languish in the Senate for one day before consideration may be humored. So the Senate took up the bill with about 14 hours left the session. Davis soon took the floor, began her filibuster and the rest is history. Although the bill was passed in a subsequently called second special session, the Democrats proved that night that they could win against all odds. For a more detailed account of that fateful night in particular, check this article, which holds the distinction for the article article I ever penned that received more than 1000 hits. A year later, the bill is, unfortunately, law, but is roped up in an ongoing legal challenge that will be sure to reach the Supreme Court. Davis went from State Senator to gubernatorial candidate in similarly quick fashion. But the question remains of how Davis should treat this fateful night. I gave my own interpretation last week, when I noted that it is silly to run away from the abortion question. My colleague on The Daily Texan, David Davis, penned a thought-provoking piece yesterday suggesting that the Davis campaign’s big anniversary party was a bad idea. Many of you probably noticed I shared the article on my Facebook, and the succeeding heated debate over the matter. Honestly, my personal opinion is somewhere in between. It’s fine to look back at previous highlights, but it should not be done to the detriment of other high-profile events, as I fear this one was done. That being said, initial reports suggest that it was a rousing success and at packed capacity. The filibuster was not literally successful in that it blocked the underlying bill. But it was successful as far as that it gave a compelling impetus for Davis to run for Governor (and for State Senator Leticia Van de Putte to run for Lieutenant Governor!). For those who do not recall, the Democrats had literally NOBODY to run before the filibuster. The net gain of the event was a considerably stronger ticket. This entry was tagged 2014 Election, 83rd Legislature, Abortion, Leticia Van de Putte, Rick Perry, Wendy Davis. Bookmark the permalink.